A second HF rig has somehow found its way into my home. Since getting back into HAM radio with my focus now on CW and QRP I find that many of my contacts use old and/or homebrew equipment. Maybe it's because I often call CQ with my straight key rather than paddles that results in most answers to my CQ being operators using a straight key or a bug. It seems these operators tend to not use the latest piece of shiny gear, which made me an anomaly; sending with a straight key while using my SDR-in-a-box like the Elecraft KX3. Maybe for this reason I've found myself being drawn to less sophisticated types of equipment. I'm not talking about wanting to go back to spark gap and gravity batteries, but sometimes the KX3 is just too easy to use. In the same way that I'd prefer to send CW using a Straight Key to a keyboard since it's a greater challenge, I think that the older, less sophisticated equipment can bring more satisfaction to the hobby. Now don't get me wrong, I'm not suggesting that the only "real" radios are those with discreet components or tubes, nor am I saying no key but a straight key. I'm just moving through some stages of the hobby that I missed because I didn't grow up with this older equipment and I think the challenges can be fun to learn and operate. I didn't get into Ham radio until 2006 and the commonly available used equipment of the time was microprocessor controlled rigs with digital displays, optical encoders, DSP filters and seemingly endless menus for configuration. I went through a few HF radios over a couple of years: a Yaesu FT-857, ICOM 730 and lastly, a ICOM 746 Pro, before I sold the radios and dropped out of the hobby. At the time none of those rigs held any "magic" for me, they were just tools with increasing levels of functionality and ease of use. However the ICOM 730 did hold copious amounts of stale cigarette smoke and nicotine from the previous operator that it would release into my room as it warmed up. Not really magic, more of a non-corporeal element let's say. If you've read my earlier posts you may recall that although I like my Elecraft KX3 immensely I have some strange fondness for TEN-TEC equipment. 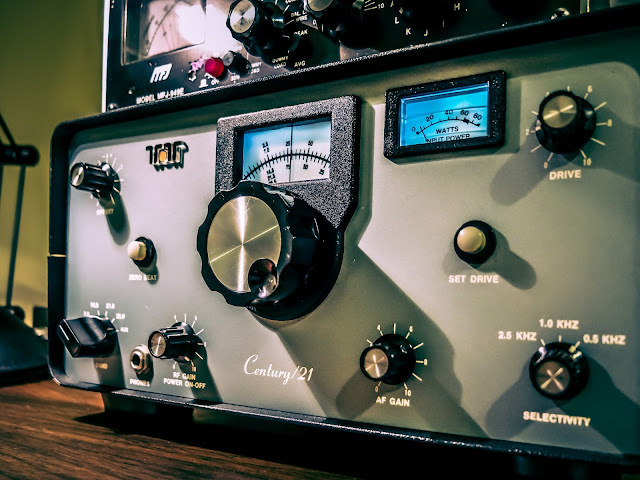 Ten-Tec has made some quirky radios with legendary full break-in QSK and supposedly smooth, quiet receivers for CW operators for a few decades now. So when a Craigslist posting leaped into my browser window (I don't know how that happened) advertising a seemingly pristine late-70s rig that had supposedly been reworked to a perfection, all for $140, I just couldn't pass it up... well at least the price in the ad was accurate. 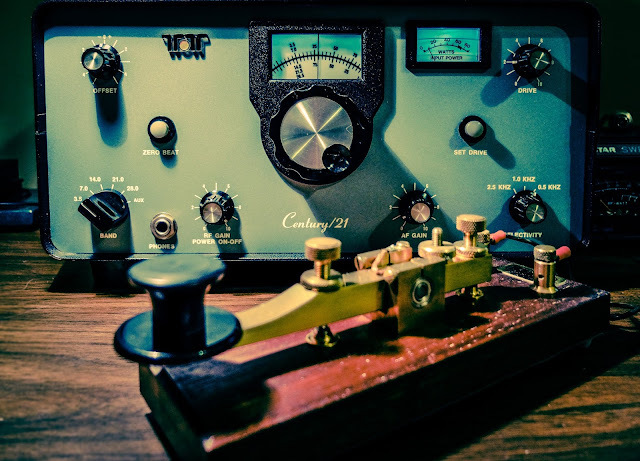 The Ten-Tec Century 21 is an interesting transceiver. In the simplest sense it was an ideal radio for the Novice Licensed HAM operator of the 1970s. It is a CW only transmitter. 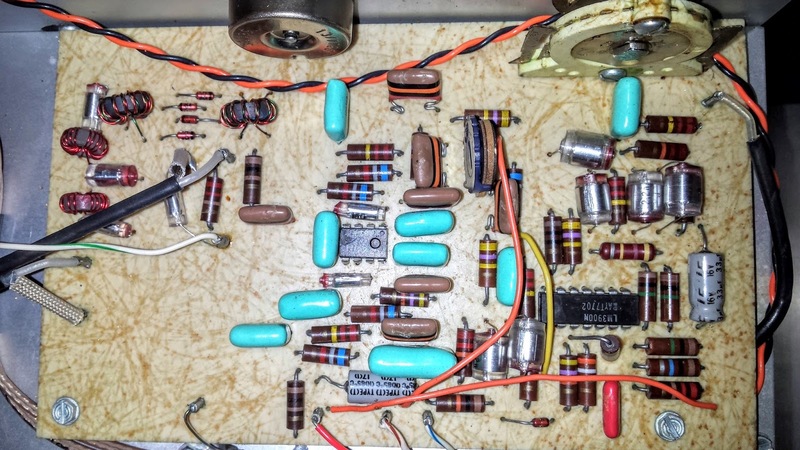 It doesn't require fiddling with a resonant tank circuit of the typical tube radios of the era to work out resonance. It has a built-in power supply that runs off 115-120v mains. It doesn't use a superheterodyne receiver but a direct conversion receiver (Ten-Tec called it a double direct conversion receiver). This resulted in a simplified design and good selectivity but without the IF there is no AGC so be ready to work those RF/AF gain knobs. It also has easy band changing and nice filtering. From web searches and reviews its most common problem is a PTO that has to be rebuilt every few years. The Ham I purchased mine from said it had been rebuilt. It doesn't slip (yet) but it's kinda stiff so I expect a PTO rebuild to be in my future. I spoke with a ham I work with who has rebuilt one and he said it's not difficult, simply time consuming (but he repairs electronics all day so YMMV). Start with the radio off. Turn the radio on by pushing in the RF Gain knob (it is the on-off switch). Find and open frequency (wait, listen, wait again, listen) and while holding the Set Drive button apply just enough power using the Drive knob to give you some RF out for matching your antenna. Better yet use a frequency analyzer to tune QRM free. After you're matched up you can bring the power up to where you want to operate. Unfortunately this can't necessarily be done into a dummy load unless you're match is near 1:1. The SWR will affect how much output drive you can use. If you're going to run QRP then no worries because you won't be running the power input up to a point that could trip the final, Maximum input power is marked by the thick line on the Input Power meter (about 70w). This results in differing output wattage dependent on antenna resistance and frequency. I found that into a 50ohm dummy load I could generate up to 40w output for 80m, 35w output for 40m, 30w output for 20m and so on, down to about 15w output on 10m. As I plan to use the rig for QRP this is mostly academic. It certainly can provide more than QRP output levels if conditions warrant. This seems more complicated than it should be but I'm guessing after I've done it a few dozen times it will become automatic. The CW tone you hear is the difference between the current PTO tuning and the position of the Offset knob. The Offset knob can be an offset to either side of the current frequency (think of this as CWR depending on your band). In other words the zero position of the Offset knob applies zero audio offset to the currently tuned frequency so you wouldn't hear a tone from a signal with zero offset. You should have the Offset knob slightly to the left on 80m and 40m (LSB offset) and slightly to the right of zero for the USB bands. So with the information above in mind... Pressing the Zero Beat button defeats whatever the Offset knob is set to (effectively zeroing the offset). When you are exactly on frequency with a signal the audio from the signal nulls (goes silent). This null / silence is your indication that your transmitter frequency matches the other station. However I've found that the Null or Zero Beat is quite broad, such that you could be up to 250Hz off frequency based on where you leave the PTO in the Null. For my radio, on LSB bands, I press the Zero Beat button, find the null and then go past it (turning the knob to the left) and then just tweak it back into the null. At least for my radio that works. Maybe other Century 21s have a finer Q on the Null. 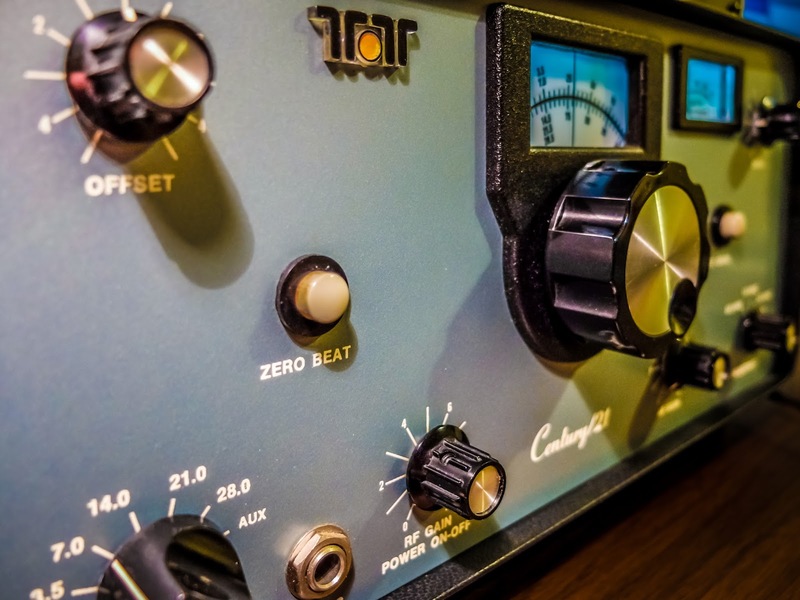 After you have zero beat the signal you can use the Offset knob like a RIT. The range on that knob is really broad. I think the manual said 5kHz so just a touch goes a long way unless you like to listen to CW with a ear piercing 2kHz, high pitched tone. The Century 21 has full break-in QSK on at all times. It is extremely clean with no discernable pops or artifacts. One complaint I have is that the pitch and tone of the sidetone itself is fixed. You can vary the volume through a little hole in the bottom cover to turn a thumb wheel, from very loud to just loud but you cannot change the pitch and it's a bit harsh sounding. The headphone jack on my particular radio is broken. I need to open it up to resolve that before the wife uses a large heavy object on my beautiful new transceiver. This video demonstrates the receiver selectivity of this old radio. This is a bare bones transceiver with just the basics necessary for CW communication. As far as information for the operator: Well there's an analog dial that gives you a rough indication (within 5kHz) of where you are transmitting, and an input wattage gauge for the drive and that's all. Notably missing is a Signal Strength meter so the signal reports you send will be based on your ear, or how generous you're feeling at the time. It's a little funny to me that I'm enjoying using this radio given it's lack of... well just about everything compared to my Elecraft KX3 whose tiny display indicates Signal Strength, Signal Relative to Zero Beat, SWR, RIT Offset, VFO A/B (down to a 10Hz range) Time, PA Temp, etc. It just goes to show you how much modern rigs have that, when it comes down to it, isn't actually necessary for communication. Frequency Coverage: 3.5 to 4.0; 7.0 to 7.5; 14.0 to 14.5; 21.0 to 21.5; 28.0 to 28.5; 28.5 to 29.0 MHz. (Crystal not supplied for 28.5 to 29.0 MHz, but available as accessory, Model 273.) Note - Early models only included crystals for 3.5, 7, and 14 MHz bands. Crystals for 21 Mhz and 28 Mhz bands were available as optional Models numbers 271 and 272. VFO Frequency Stability: less than 20 Hz change per degree Fahrenheit, averaged over a 40o change from 70o to 110o, after 30 minute warmup. Less than 20 Hz change from 105 to 125 VAC line voltage. Direct Frequency Readout: Marked in 5 kHz increments from 0 - 500 kHz, MHz markings for each band displayed. Tuning Rate: Approximately 17 kHz per revolution of main tuning knob. Power Requirements: 105 - 125 VAC, 50-60 Hz. 10 watts receive, 100 watts transmit. Semiconductors: 25 transistors, 26 diodes, 5 integrated circuits. PC Boards: 4 plug-in types, 6 integral. Construction: Rigid aluminum chassis and sub-panels. Aluminum case. Grey front panel, black textured vinyl cover. Dimensions: HWD 6.125" x 12.5" x 12"
Sensitivity: 1 uV or less for 10 dB S+N/N. Selectivity: Three position; 0.5, 1.0, and 2.5 kHz. VFO Frequency: 5.0 to 5.5 MHz. Double Direct Conversion. Antenna Input: 50 ohms, unbalanced. Audio Output: 1 watt @ 8 ohms, less than 2% harmonic distortion. Built-in speaker; PHONES jack. Offset Tuning: Approximately +/- 5 kHz, defeatable with ZERO BEAT switch. RF Output Power: 25-30 watts, typical. Output Impedance: 50 - 75 ohms, unbalanced. 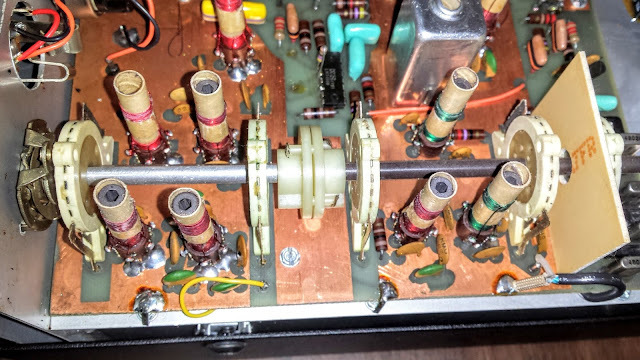 T/R Switching: Full break-in cw with PIN diode switch. Sample QSO... Listen to the lovely receiver but the horrible sidetone. Update: Here's another QSO I made a few months later into learning the Code. And here's yet another from Straight Key Night 2017. As I use the rig more I'll try to make some recordings and post them in subsequent blogs but that's all for now. Great working you Rich on your Century 21 yesterday. It was doing a great job for you with your Kent straight key. I used to own a Century 21......bought it new in 1979 and worked the world with it. Wish I still had it! I had one and didn't make a single QSO with it; I ended up returning it. The Century 22 was a far better rig. She's a fun old radio Rob. I've had a couple hundred qso's using it and many a long ragchew. But it's not a feature laden rig by any stretch of the imagination. I love the older Ten-Tec rigs . I have an Omni C that I use along with one of several straight keys for CW . Simple rigs and simple wire antennas put the fun back in ham radio . Skill over brute power . I like the blue glow panel and S meter lamps . How did you achieve that and did you use LED replacements ? I may do that on my rig . Looks really nice . Hello Bob, the panel lighting was "blue" when I received the radio. Someone before me had taken some blue translucent plastic and wrapped in cylinders around the bulbs. When I pulled the cover (shortly after taking this photo) I saw that it had melted the blue plastic sheets in a couple of places and left burnt debris near the PTO adjustment slug and in general was a fire hazard. I removed the blue plastic and as much of the tape as I could. now it's back to good old fashioned white light. I assume someone was trying to make it look like a Drake. Had one between my Ten Tec Argonauts 509 and my FT-101ZD. I so regret selling both of them. I am starting in CW and after reading your article on the Century 21 would like to get one of these units. Found one missing Crystals for 21 Mhz and 28 Mhz bands. Are these easy to find? To install? Thank you!!! I'm not sure where to source these cyrstals. If the one you found is in otherwise good condition and less than $100 then it would still be worth it especially with the weak sunspot cycle over the next few years, you will not be missing 21 and 28Mhz. I agree, vintage equipment has something special. My rig is an old PARASET that I bought in France. Congratulation for so interesting website!